Reading Time: 1 minute The newest custom-painted aircraft to join the WestJet fleet features Anna, Elsa and Olaf from the beloved Disney movie, Frozen. 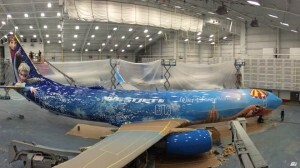 It is WestJet’s second custom aircraft in collaboration with Walt Disney Parks & Resorts. WestJetters worked with Disney Artists to design this cool new livery which comes to life in this time-lapse video.